Having a microfiber towel close by is always a good idea when you’re traveling or at the gym, so grab one now from Acteon for just $15. Enter in code HOLIDAY17 to save 50%, plus get a free gym towel (smaller version) and drawstring bag with your purchase. The microfiber towel dries 3x quicker than the average cotton towel and absorbs 3x its weight. Unfolded they’re 30" x 64" while easily rolling up to a mere 3" x 3" x 7" with the integrated elastic band. It has a silver ion, anti-bacterial treatment to fight odor. 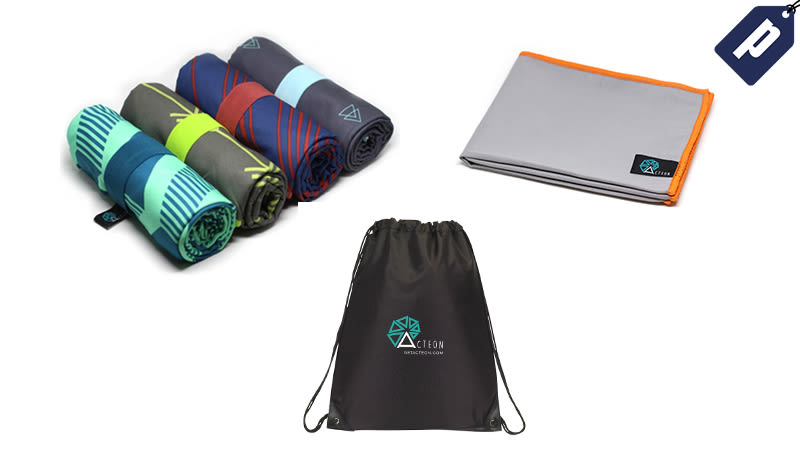 The gym towel uses the same anti-bacterial microfiber material to fight odor, but includes a snap band to compliment a compact design (15.35" x 23.62" unfolded, 1.75“ x 1.75“ x 4“ rolled up with the integrated elastic band). Save 50% and grab a microfiber towel for $15 with promo code HOLIDAY17, plus get a free gym towel and drawstring bag.